It's a simple truth: Your thoughts lie. "You don't have to believe every thought that passes though your head." This was something my mother taught me as a young girl that has helped me tremendously in life. I don't know where those thoughts come from or why our own thoughts can be so self-sabotaging, but recognizing that most of our negative thoughts are lies can be the difference between pushing through to the next level or giving up. Everyone knows about runner's high and how those endorphins can make us feel on top of the world (usually, after we finish running)! But the truth is that sometimes we have runs where we feel tired, worn out, discouraged, and lacking of confidence. A lot of times it is all in our heads. 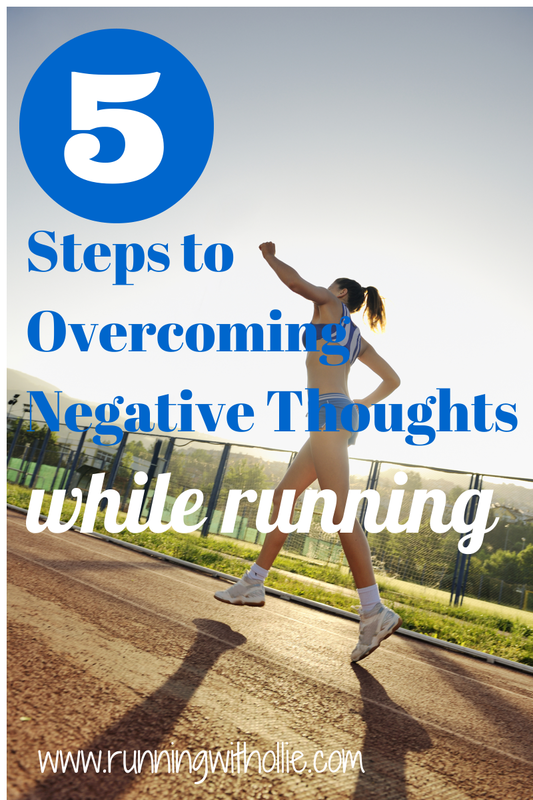 So how do we overcome those negative thoughts in order to have the best run possible? 1. Don't think about it, just do it. This may be the simplest one, but not always the easiest. Sometimes you just have to block out all thoughts and just move forward. Don't feel like going for a run today? Don't think you can survive one more interval? One more mile? Don't think about it, just do it. Move forward. I saw something on Pinterest that said that the tongue should have three gatekeepers: Is it true? Is it kind? Is it necessary? I think these same three questions should be applied to the negative thoughts in your head. Most often the answers are no, no, and no. Just because you think it, doesn't mean it is true. You can do this. Keep going. 3. Replace negative thoughts with a positive mantra. When a negative thought says "I can't do this" replace it with "I can do this, I am awesome!" I often repeat "You can do it, you rock!" (Nerdy, I know.) If you talk to yourself in a positive voice, you will start to believe it. If you are going to believe the lies in your head, at least let them be positive ones! 4. Accept that trying and failing is better than not trying at all. And you never really fail as long as you keep trying. Not every run is going to be a great run. You are not going to PR every race. Feeling less like Kara Goucher and more like Snuffleupagus some days is probably normal (it's not just me, right?). The fact that you are out there doing it is success in itself. Think of all the people that never even try. It's our egos that tell us if we can't be great, then let's not do it at all. 5. Listen to your body, not your mind. Know the difference between listening to your body and listening to your mind. I never advocate running through physical pain because physical pain is a signal that something is wrong. However, running through mental pain is necessary to progress. Learn to really know the difference. As Jillian Michaels likes to say, "Get comfortable with being uncomfortable!" How do you overcome the negative thoughts when you run? I've been bad at the negative thoughts previously, but I'm really trying to turn this around now. At any point I feel tired or uncomfortable, I tell myself, "Push past the discomfort." I say it over and over. I read a very good article (unfortunately, I can't remember the source) that discussed the science behind how most fatigue felt during workouts is mental and not physical. The author commented on how athletes were pushed to their max, given a few seconds break, and then told they had to repeat the exact same thing. And they did, even though they said they were completely done and fatigued after the first trial. They were physically able to perform the same tasks (maybe at a reduced outcome) even though their brains told them they couldn't go on. So there's some kind of proof that you just need to work through the tiredness and understand what your body is telling you, not your mind. yes, it is definitely something that some of us how to work on, like we train our bodies, we train our minds! Great tips! I usually try to replace my negative thoughts with a positive mantra and break whatever I am doing into intervals. "Run the interval/mile" mindset really helps me. I do the positive self talk thing all the time, it has gotten me through many a bad run!! Great post! I love number of 1 & 2, I always fight with number 3! I was just having this discussion this morning. I agree with positive affirmation but I think what people miss is they need to be practicing the affirmations regularly. Otherwise when faced with stressful stimuli they will fall back to their comfort zone which might be negative thought patterns. When positive affirmation becomes routine, it is easier to access under duress. Great tips! You definitely nailed this post. These tips seem so easy yet they are incredibly difficult to execute! Thanks for sharing! I have always heard that exercising is a way to release Endorphins and fight against feelings of depression and the bodily chemicals that influence this. As a wheelchair bound person, I have to work a lot harder to get up to enough physical activity to produce results. Recently, I have been stressed out and depressed by my life situation right now. It would be great to find some exercises that are vigorous enough for me to produce those anti-stress mechanisms and promote positive thoughts.